Bird Seed, get it from a company I have located calledeBirdseed.com which will deliver a variety of quality bird feeds directly to your door. They have a variety of Wild Bird Seed. 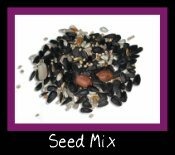 The seed mixes are designed to attract beautiful birds to your garden, such as finches, woodpeckers, nuthatches, bluebirds, mockingbirds, wrens and warblers. Birds are great to have in your garden. They're really not that picky. You can bet that just about anything you put out, somebody is going to eat it. If you are trying to attract certain birds, then, you will want to spend a little more time deciding what to get. Bird Seed Chart and Bird Seed Recipes . Copy and hang it on the fridge. To help you even further, please visit our friends at eBirdseed.com because your birds deserve quality seeds and you deserve the convenience. 1.Nectar: This basically sugar,water, and some coloring. You can make it yourself or buy the packages where all you have to do is add water. The Hummingbirds and Orioles love the stuff! 2. Suet: There are some birds that don't eat seeds. These are birds like the Nuthatches and the Woodpeckers. These birds usually eat insects. Suet is beef or mutton fat. 3. Black Sunflower Seeds: These seeds are one of the best seeds you can use in your feeders. Most birds really love them. The fat content is very high. 4. Peanuts: Use raw peanuts not the salted variety. You may want to crack them up a little. If not, only the larger birds will be able to eat them. The stores have special feeders that will dispense the large peanut pieces. 5. Cracked Corn This is dried whole kernal corn. 6. Millet There are two kinds of millet. Most birds like the white best. It has a little sweetness to it and is high in protein. 9. Peanut Butter My birds love peanut butter. I use it to make my pinecone feeders. It is high in protein, fat, and oil. P.S. My dogs love it too. 10. Fruits Fruit is good for birds that particularly like seeds. Try all kinds of fruit. Even dried fruits are good. ..11. 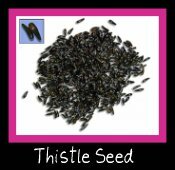 Thistle Seed: This seed has a very high oil content. There are special feeders for thistle seed, so that it will not be wasted. ..12. Wild Bird Seed: These are the seeds that you will find in your neighborhood grocery store. They usually contain a lot of fillers that the birds don't especially like. I sometimes use them in a pinch. ...So, be sure that you choose the right kind of bird seed and check your charts carefully. Remember*** Always have a Good Time! !